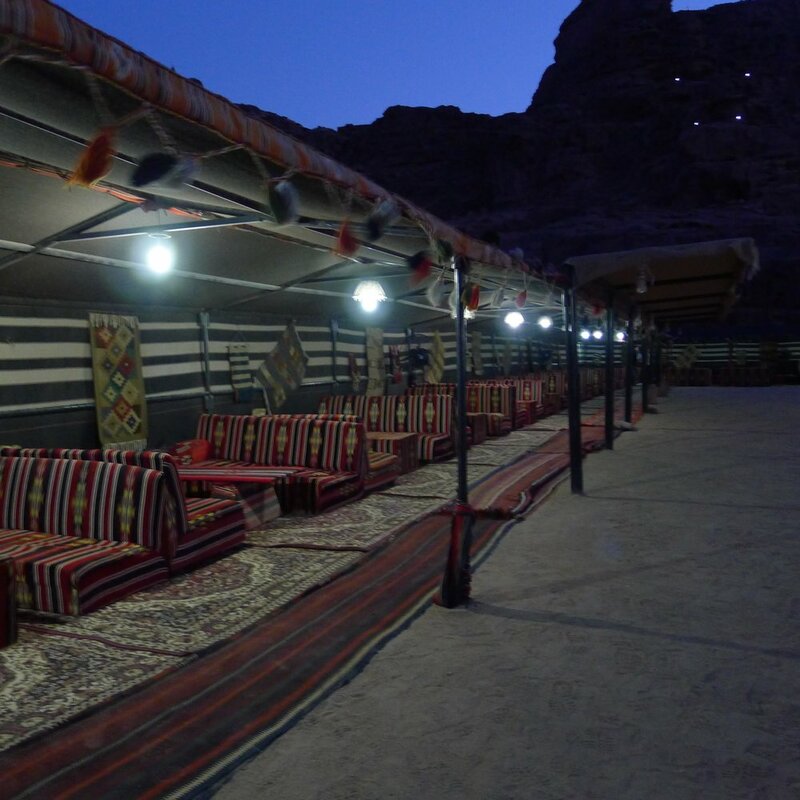 Desert camping at Wadi Rum. It’s definitely on most people’s “really want to do in Jordan” list (if not, “must do” list). It was on our list too, however, it fell more on the “how can we swing this with toddlers?” list. In our pre-kids days, we had thoroughly enjoyed desert camping in the White Desert in Egypt. We literally lay out under the stars and slept next to our campfire as we watched the milky way glide across the sky. You throw in desert fox encounters, sandstorms, an armed guard, cars swallowed by the sand, and running on gas fumes, and you have tales for years to come. However, imaging this scene with a three-year-old lying next to us, never went well. But friends recommended Wadi Rum’s Sun City Camp (http://suncitycamp.com/wadi-rum.html) and swore it was toddler-friendly. In fact, it proved to be so toddler friendly that it really wasn’t camping at all. And that was just fine for us. When I called to make the reservations (email went unanswered, so I’d recommend a phone call or a text to make reservations; +962798996212 or +962795666673), Sun City Camp was extremely accommodating. I reserved two private tents with en suite bathrooms and requested cots for the toddlers. I also requested two private jeep tours, one in the evening and one the following morning. And finally (as if I wasn’t demanding enough already), I asked if they could accommodate vegetarians; they could. We were set! They have 30 of these private tents, some with two twin beds, some with the double like ours. All can accommodate an extra bed and all come with the full bath. The rest of the camp includes a large u-shaped dining area, partially covered, where they serve a buffet-style dinner and breakfast. I’m told there is also a nightly music show following dinner, however under the life-with-toddler guidelines, the meltdown occurred before we could verify (or enjoy) that. They also have the cleanest and nicest public bathrooms I’ve seen anywhere in Jordan. The jeep safaris are taken out nightly, with each car accommodating 6-8 people in the open back (depending on size and familiarity). You can drive your own vehicle and follow the caravan, however, it’s an almost guarantee that you will get stuck and everyone will have to wait as you get pulled and pushed out of the sand (so hire the jeep, please). They have a designated route where they’ll take you to see petroglyphs from the Thamudic period, let you and the kids climb a daunting sand dune, and then end up at a nice spot for sunset watching. From there, you’ll head back to camp. For our tour the following morning, we liked our driver from the previous day, so we requested him again. This time, he took us out in the opposite direction and showed us some fabulous desert landscapes of rocks, sand dunes, camel pastures, etc. The highlight for the kids, other than flying (un-seatbelted) over dunes, was discovering Sparky the Beetle. Can’t beat a dung beetle for pure toddler entertainment value. We made sure Sparky remained unscathed, then headed back to camp to gather up our things and head home. All in all, considering all our variables (namely toddlers), we had a fabulous time and would definitely return to Sun City Camp again. And next time, I might even take a break from the toddler-tantrum and venture out of the satin castle to get a glimpse of the milky way.